Below is a press release just received from Aerostich/Riderwearhouse. I envision these attached to mirror stalks as conspicuity lighting for night time, bad weather or commuter duty. Keep really bright LED lights at your fingertips -- or mount them just about anywhere. 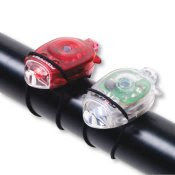 The Bug Lites' built-in mini-elastic cord wraps securely around handlebars, fairing braces or rear-view-mirror stems, and the light stays put. Handy for tank bag map reading, navigating a dark unfamiliar stairwell, or bed time reading without disturbing anyone nearby. Under each light is a curved rubber pad so they won't move around when attached to cylindrical objects. 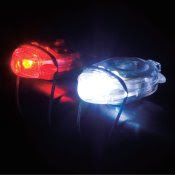 These lights also are great as handy, powerful keychain lights -- their easy on/off power switches are water-resistant push-buttons and control two distinct lighting functions: Continuous on, or Flashing. One push for "on," the second push for "flash," the third for "off". Small enough to carry anywhere, they’re not much larger than a quarter. Includes one super-bright white and one super-bright red light. Each light comes with a replaceable button battery. 2" x 1" x .75"
If you're not interested in paying the Aerostich Tax, you can find similar lights for less than $10 at your local bicycle shop. Thanks for the tip, Stacy; always good to hear from you!